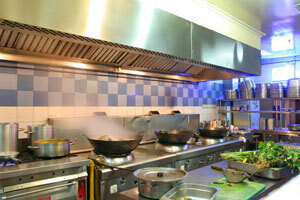 Any place that cooks food commercially should have their kitchen hood system cleaned sometimes refers to as kitchen exhaust cleaned on a regular basis as specified by NFPA 96 and other local codes. This includes, but is not limited to, restaurants, nursing homes, hospitals, churches, elementary schools, middle schools, high schools, colleges, universities, military bases, theaters, jails, prisons, race tracks, theme parks, bowling allies, convenience stores, and truck stops. Grease from your commercial cooking operation is intended to be captured by your hood and exhausted through the baffle filters, into the plenum, up the grease duct, then through the fan and into the air or captured by a grease tray beneath the fan. Routine hood cleaning/kitchen exhaust cleaning, as outlined by NFPA-96 guidelines, will keep all these areas free dangerous grease build-up preventing fire hazards from ever existing! Drap new plastic sheetings around the area being cleaned. Place plastic funnel under the hood which will drain the buildup of grease removed from the system. This ensures that the grease removed from the system will be filtered out from going down the floor drain. Clean vertical and horizontal ducts, through access panels, if any. We mop the floor after our service. Pro Duct Cleaning will provide professional services. Our certified Crew Leader will supervise or perform work with the crew to assure quality work. We are open 7 days a week to offer flexible scheduling to meet your specific scheduling needs. We maintain computerized tracking system for maintenance schedules. We will contact you for future scheduled maintenance services. We will document our cleaning by submitting Before and After Service Report which details cleanability of your vent hood system, list any deficiencies with recommendations and in some instances include before and after photos. The payment can be made at the end of the cleaning or we can submit an invoice by fax, email or mail depending on your instruction. We will submit an invoice to corporate office for regional or national accounts for payment. We will make a courtesy call after the following day to ensure customer satisfaction. We return all calls and address any concerns immediately. We guarantee our service to pass inspection. If our cleaning does not pass inspection when you follow our suggested regular maintenance schedule, we will perform the cleaning free until it does! *Please note that if your exhaust system has not been on a regular maintenance schedule, sometimes, it requires more than one cleaning to bring it to our company's standards. Our customers have an option to enroll in our PDC Bonded Key Management program. Our certified Crew Leader will enter, clean, and close your facility according to your instructions. The key can be returned to you the next business day or stored with our company for future scheduled cleaning. This service is free.